Chocolate and orange—Love it or hate it? This is one of the (grueling) debates we used to have in the Fine Cooking magazine test kitchen when it came time to test recipes for the holiday issues. There was always a chocolate soufflé or chocolate something that had orange zest or oil added to it. Some of us were firmly on the side of “no orange in my chocolate!” Me, I happen to be a fan. That bright, citrusy tang adds complexity by bringing out the fruity side of a good bittersweet chocolate. But, yeah, in the scheme of things, these are not the kinds of debates that are going to keep us awake at night. (Although they are a good diversion from things that are!) And really, the one thing they remind me of this time of year is what a gift those test kitchen tastings were. After eight years at Fine Cooking—and hundreds of recipes tasted—I had this huge collection of taste memories to refer to whenever I needed a recipe for a special occasion (or any time, really). Of course the memories were tied to recipes printed in the magazines, and I still have all 130+ regular issues on the bookshelf right behind me. But lucky for you, they are all (mostly) online at this point (and available in a CD). And better still, recipes have been collected into specially themed magazines which are easy to reference. 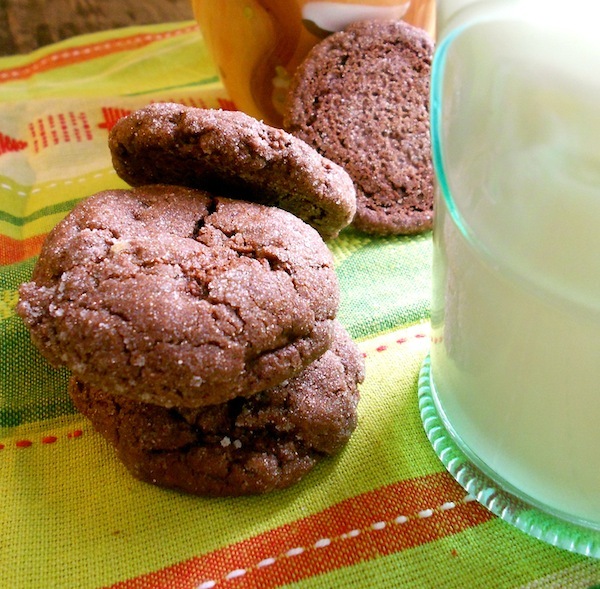 So when it comes time to start baking cookies in December, I just pull out my Fine Cooking Cookies issue. (You can purchase it for $7.49 in the Taunton Store right now). 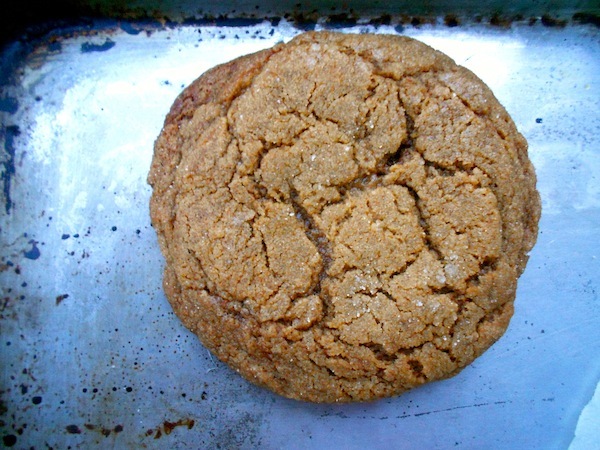 Most of my favorite cookie recipes are from my favorite baker, Abby Dodge (the author of several outstanding cookbooks, including The Weekend Baker). I got to know Abby when we were mere children (ha!) in the early days of Fine Cooking. Abby was the magazine’s first test kitchen director. She is a chocolate genius. 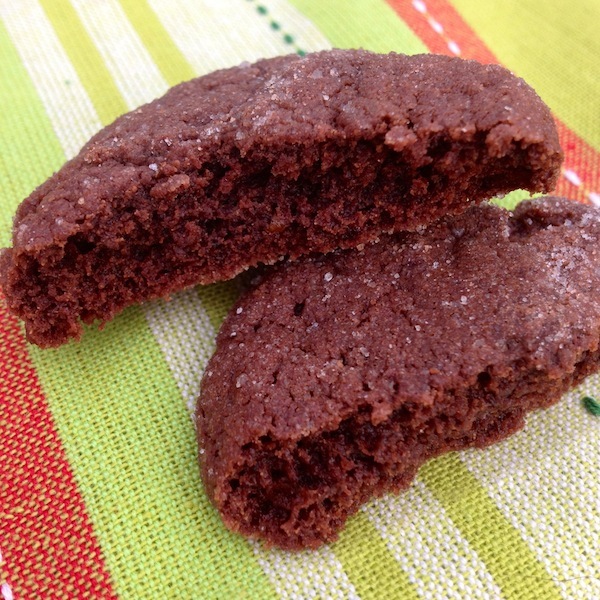 So even though I realize this is supposed to be a blog about cooking and growing vegetables, I am going to share Abby’s Dark Chocolate Crackle Cookie recipe with you today. I simply have cookie-brain right now. 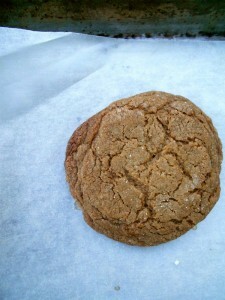 After posting the Giant Molasses Crinkles recipe last week, I thought, well, I’ll just keep on cookie-ing for now! Since my Dad is arriving today and he is a fellow-chocolate lover (he used to secretly steal bites out of my chocolate Easter bunnies), I figured it was a good time to make what may be my favorite holiday cookie (at least in the top three). And yes, there is orange zest in this chocolate recipe. But the wonderful news is that the cookie is delicious with and without it. I’ve used the suggested 2 teaspoons, occasionally 1 teaspoon, and sometimes none. All have been wonderful. There is a lot of cocoa and chocolate here, but the investment is worth it since the recipe yields a lot. 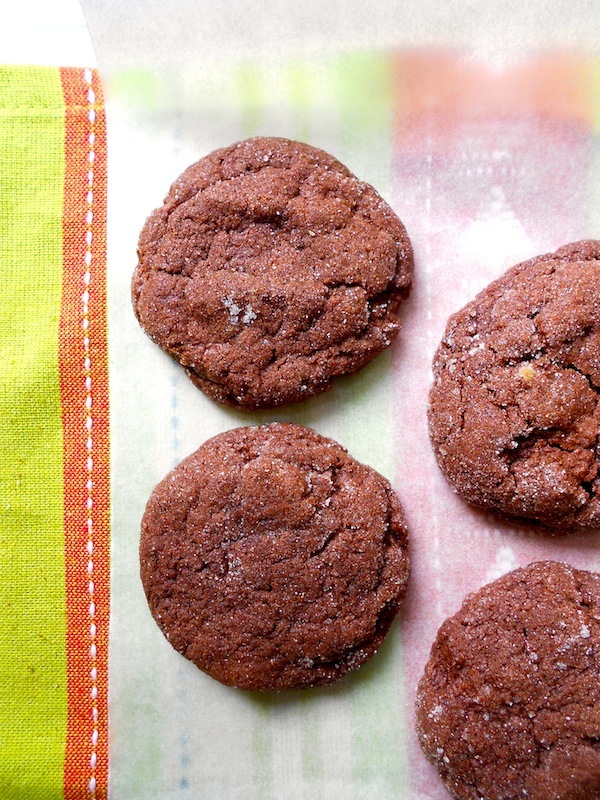 These deeply flavorful chocolate cookies have a light, cakey, almost-brownie-ish interior. They are fragile when hot, so let them cool for several minutes on the cookie sheets before moving. 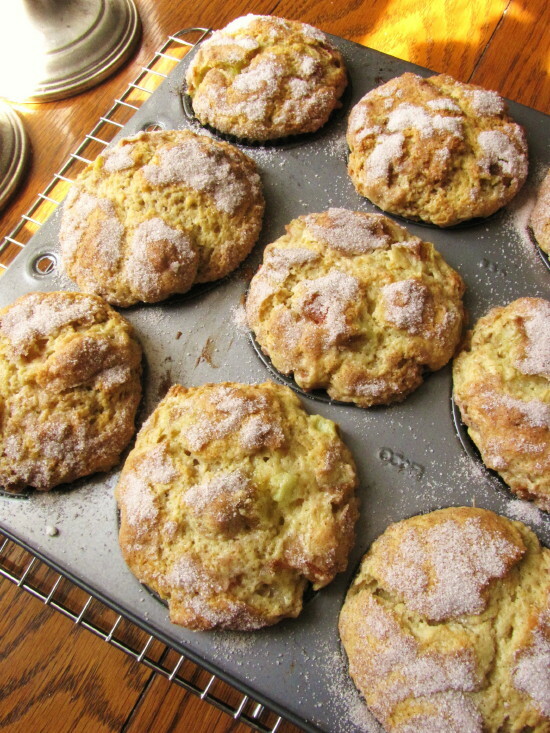 You can freeze balls of dough for up to 1 month instead of cooking them all right away. Thaw them overnight before proceeding with the recipe. Position a rack in the center of the oven and heat the oven to 350ºF. Line three large cookie sheets with parchment or nonstick baking liners. 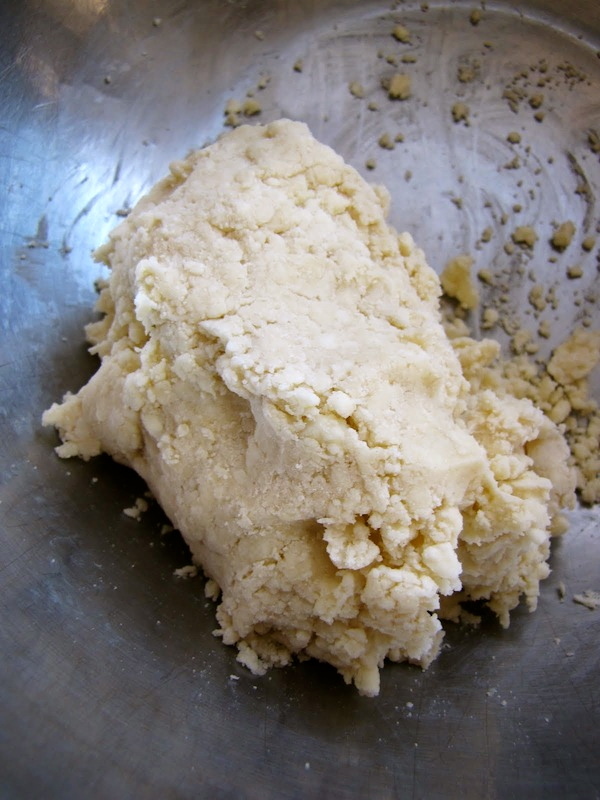 In a medium mixing bowl, whisk together the flour, baking soda, and salt. 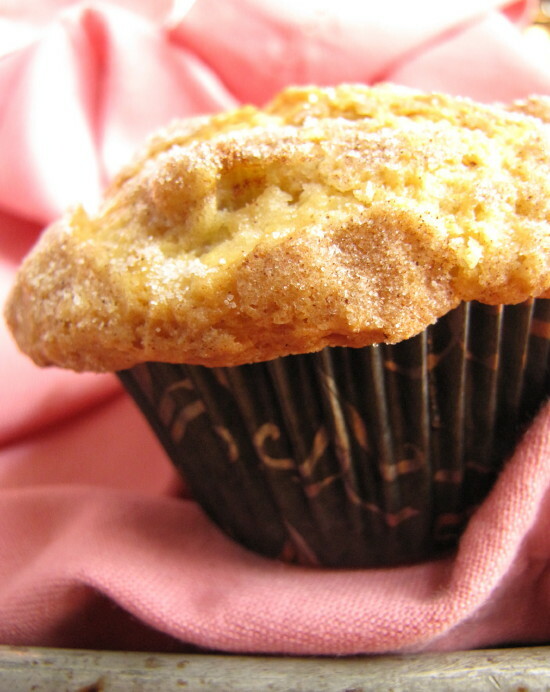 In the bowl of a stand mixer fitted with the paddle attachment (or in a large mixing bowl with a hand mixer), beat the butter, brown sugar, cocoa, orange zest, and vanilla on medium speed until well combined, about 4 minutes. Add the eggs one at a time, beating briefly between additions. Add the cooled chocolate and mix until blended, about 1 minute. Add the dry ingredients and mix on low speed until almost completely blended, about 1 minute. Add the chopped chocolate and mix until blended, about 15 seconds. Shape the dough into 1-1/4-inch balls with a small ice-cream scoop or two tablespoons. Pour the granulated sugar into a shallow dish. Dip the top of each ball in the sugar and set the balls sugar side up about 1-1/2 inches apart on the prepared cookie sheets. 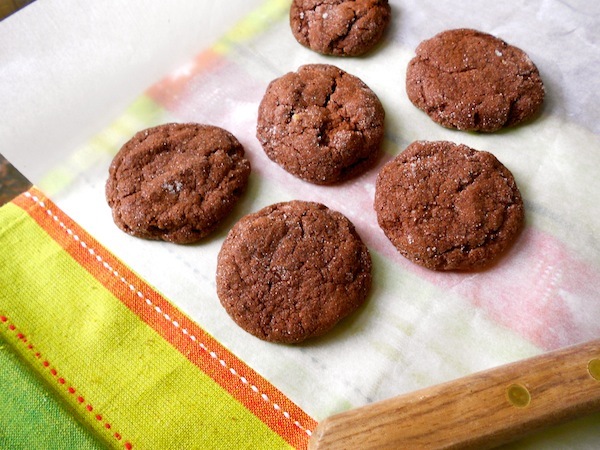 Bake one sheet at a time until the cookies are puffed and cracked on top, 11 to 12 minutes. 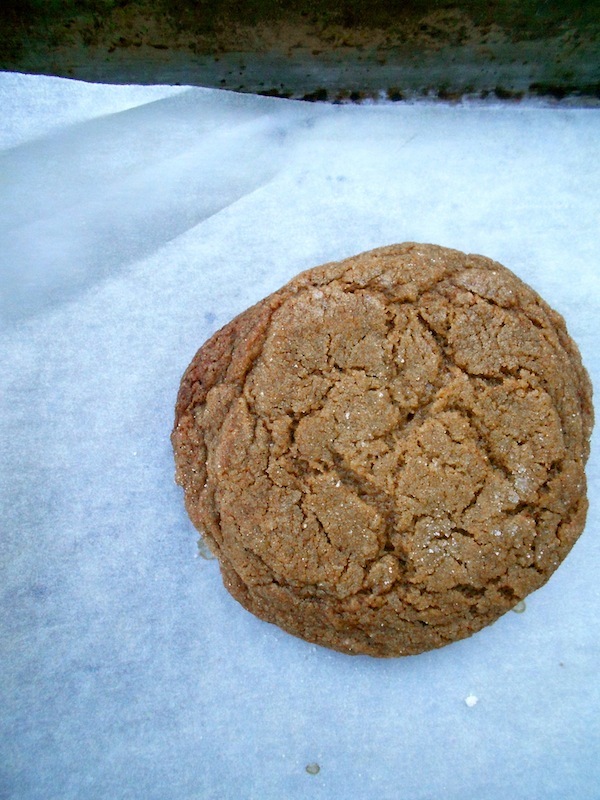 Let the cookies cool on the sheet for 5 minutes before transferring them to a rack to cool completely. Yesterday I was hiding out in the hoop house, pretending that I didn’t have a long list of things to do before getting on a plane tomorrow. It was warm and bright and still inside, the air spritzed with the fine smell of damp potting soil. I could have stayed there for hours, futzing over the hundreds of little baby bok choy seedlings that have popped up in the last week. We planted the bok choy seeds with the grand scheme of getting an early crop into our south-facing bed along the outside of the hoop house. Roy has been prepping the bed and installing hoops and a plastic cover to warm the soil up for planting. 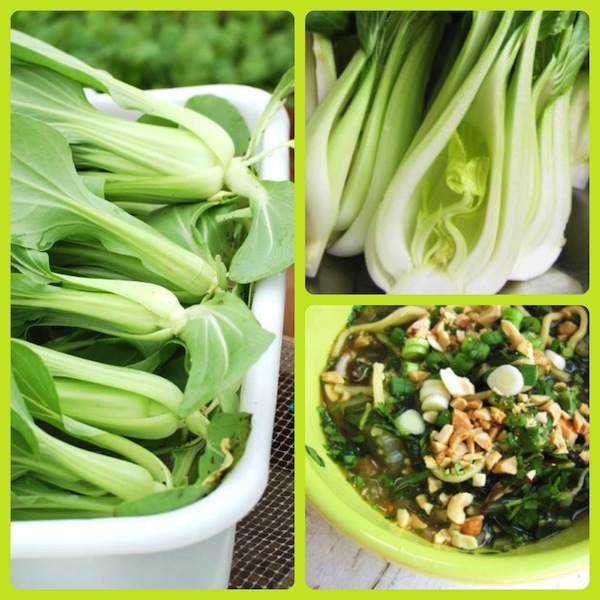 Bok choy can go into 50° soil and by using transplants, you can have a harvest in about a month after transplanting. 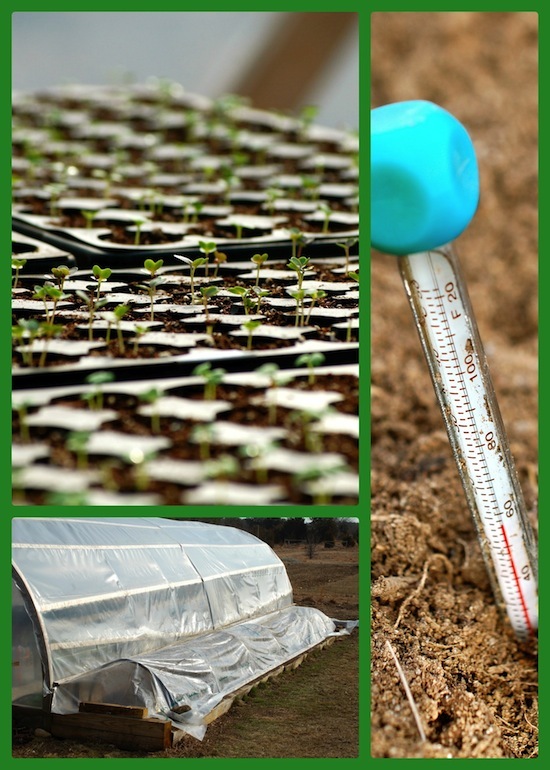 Even though we have the hoop house now, it isn’t heated, so the nighttime temperatures are still pretty chilly in there. 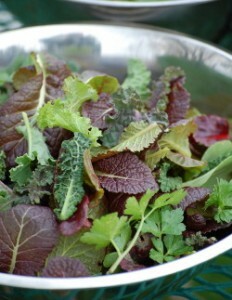 (The greens in the raised beds have covers over them.) So we had to germinate the bok choy seeds inside. First, I mixed up the seed starting soil (with water) and spread it in 72-hole flats in the hoop house. Then I carried the flats inside, planted the little tiny seeds, covered the flats with plastic tops, carried them upstairs, and arranged them over the floor of Libby’s bedroom. Then I shut the door to keep the room cool and to keep Barney out. So you can see, we still do not have a very sophisticated system of seed starting. And, by the way, though Libby’s room was the perfect temperature, and the seeds germinated very evenly, Barney did get in there more than once and pounced on the plastic tops. I think he got in because Farmer nosed the bedroom door open, thinking Libby might be in there. Still, we’ll call that part successful. However, we’ve then had to carry the flats down to the hoop house every morning—and then back every night. 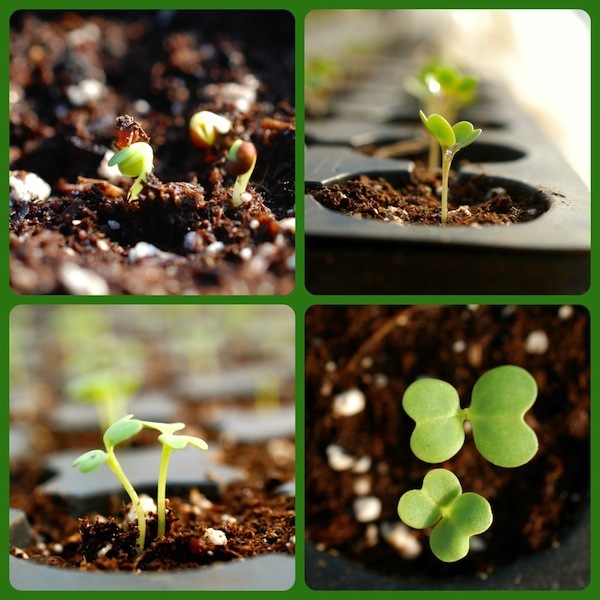 The seedlings grow straight and sturdy in the gauzy overhead sunlight of the hoop house, so you want them there during the day. (Without adequate direct light, seedlings grow leggy and sideways, as most of you probably know. ) And very soon we’ll be able to just pop the plastic tops back on at night and leave them in there. But right now, because of this ridiculous weather (50° yesterday, 25° and snowing today) the flats have to go back inside the house at night. Argh!! 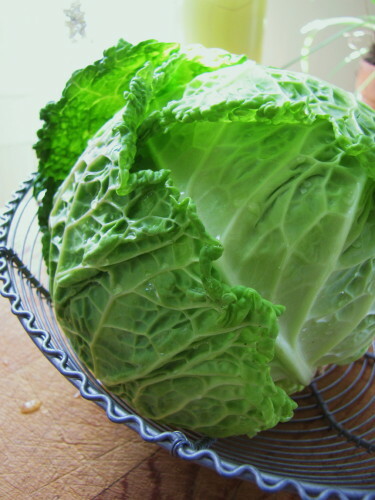 Since I won’t be actually here on the Irish holiday, I thought I’d better share my favorite cabbage recipes from Sixburnersue with you today. 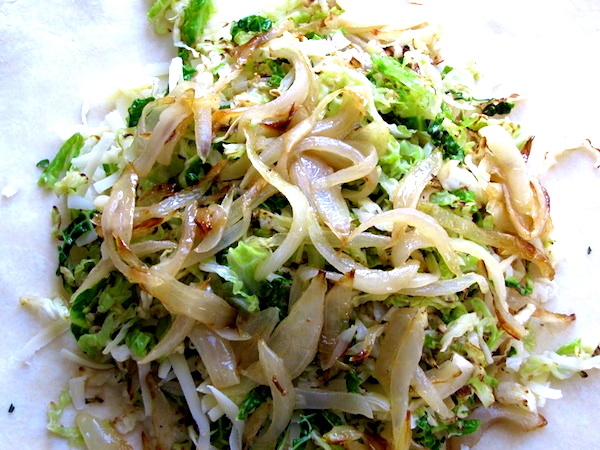 I’ve never been one for boiled cabbage, so for a simple preparation, I go with something like this Quick-Sautéed Cabbage recipe. 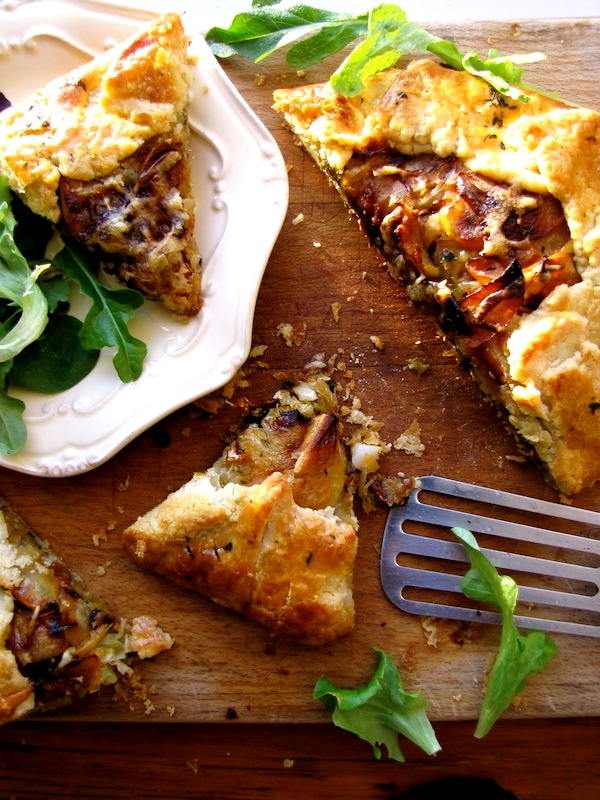 For something fancy, there’s always the Savoy Cabbage, Apple, Onion & Gruyere Rustic Tart. But probably my favorite holiday cabbage side dish (with the same flavor profile as the tart, just with potatoes added) is this St. Patrick’s Day Cabbage, Onion Apple & Gruyere Gratin. 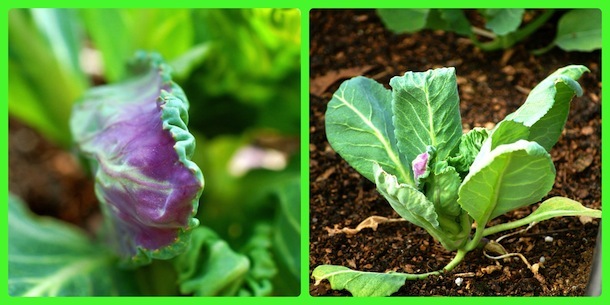 I may not get to eat one of these dishes on St. Patrick’s Day this year, but I do have some cabbage to look forward to—I planted some cabbage seeds directly into one of the hoop house beds last fall, and I now have a few tiny cabbage plants starting to form heads. With any luck, I’ll have cabbage on say, May Day! And baby bok choy even sooner. Can’t wait. 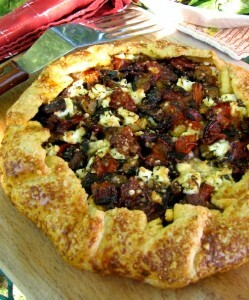 My affection for buttery, flaky crusts and sweet, caramelized vegetables came together one magical day many years ago. I realized that the wonderfully easy food-processor tart dough I had learned as a young cook at Al Forno restaurant wasn’t just for dessert. As much as I like a good rustic fruit tart (and there is one to die for—Little Pear Crostatas with Hazelnut Crisp Topping—in Fresh from the Farm), I am always looking for a good destination for roasted or sautéed vegetables, too. And these fun-to-make, free-form tarts (no special pan needed) are perfect for showcasing all kinds of veggies. I’ve never blogged about the tarts, though, because the recipes take up a lot of vertical space. With both the tart dough and the completed tart recipe needing to run together, your eyes would get tired! 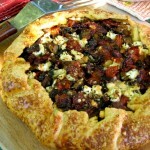 You’ll also find the tart dough recipe after the photos. 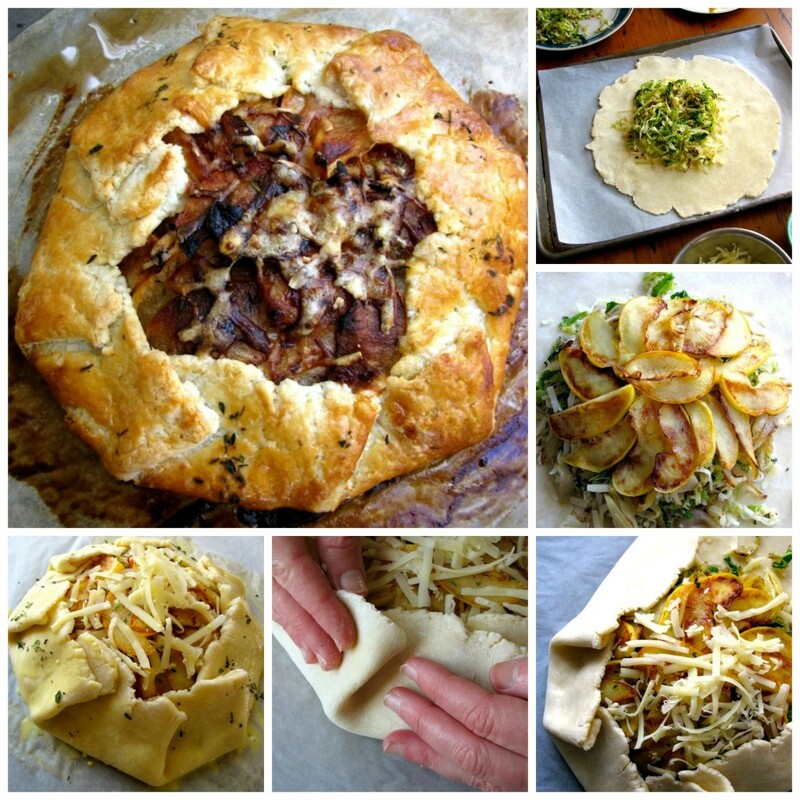 And I will put the recipe for the Savoy Cabbage, Apple, Onion & Gruyere Tart (the one in these process photos) in a separate post so that you can print it out on its own (and make it right now, while winter cabbage reigns supreme). One of these days I will also finally get my recipe formatting software working—and then the recipes will truly be print friendly. It’s on the list, I promise. By the way, rustic tarts are also variously called crostatas and galettes. After pulsing the flour, salt, cold butter and a little ice water together in a food processor until the mixture looks like small pebbles, dump the mixture into a large mixing bowl. 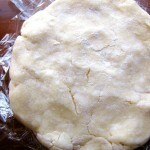 Use your fingers and the palm of your hand to knead the loose dough together into a mass. 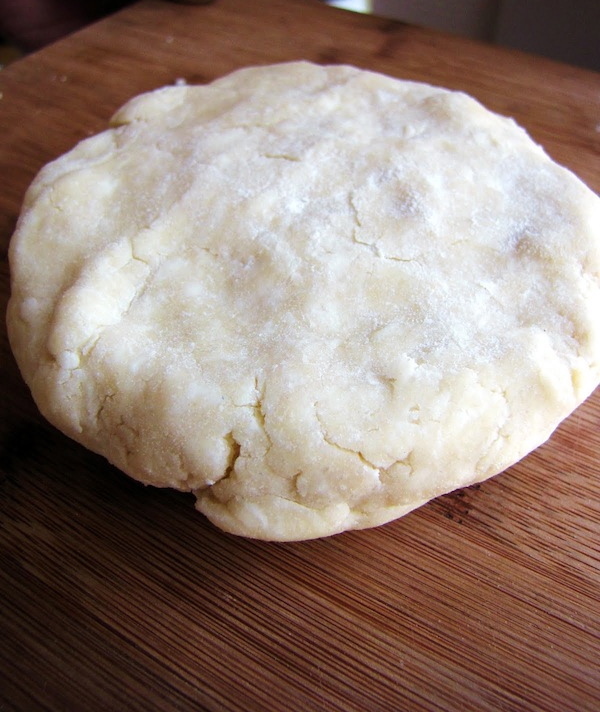 On a floured surface, pat and shape the dough into two flat disks, each about an inch thick. Wrap well in plastic and refrigerate for an hour or up to two days. Or freeze for a few weeks. Remove dough from fridge 30 to 45 minutes before rolling. Flour a large surface, get out a ruler, and begin rolling the dough disk out, lifting the dough up, tossing a little more flour underneath, and giving it a quarter turn after every roll. 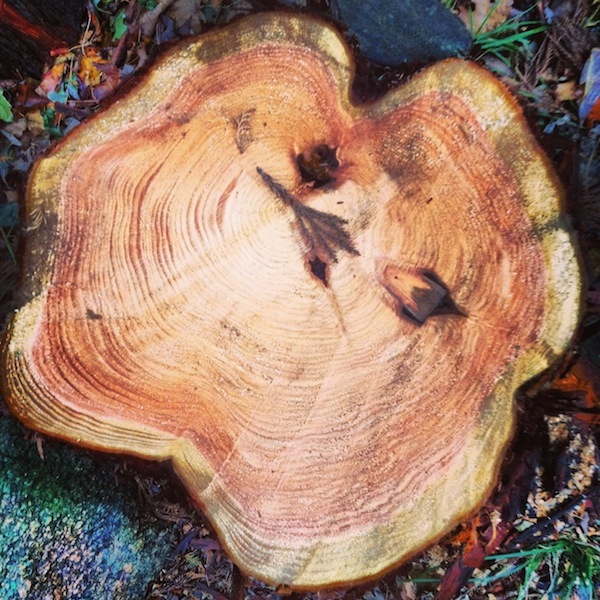 The lifting and flour help prevent sticking; the turn helps with shaping a rough circle. (I like a French pin with tapered ends, which also helps to keep you from rolling over the edges of the dough, which will squish it.) 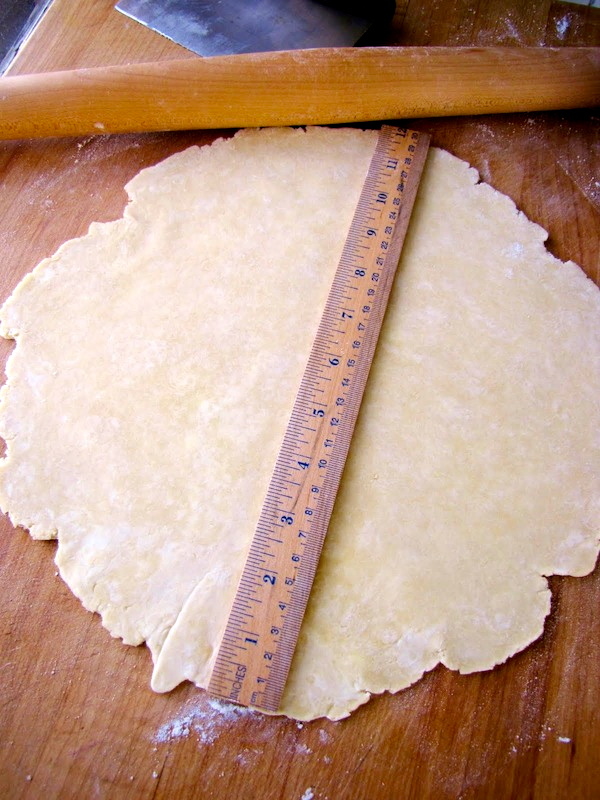 Continue to roll the dough until you have a circle roughly 12-inches wide. 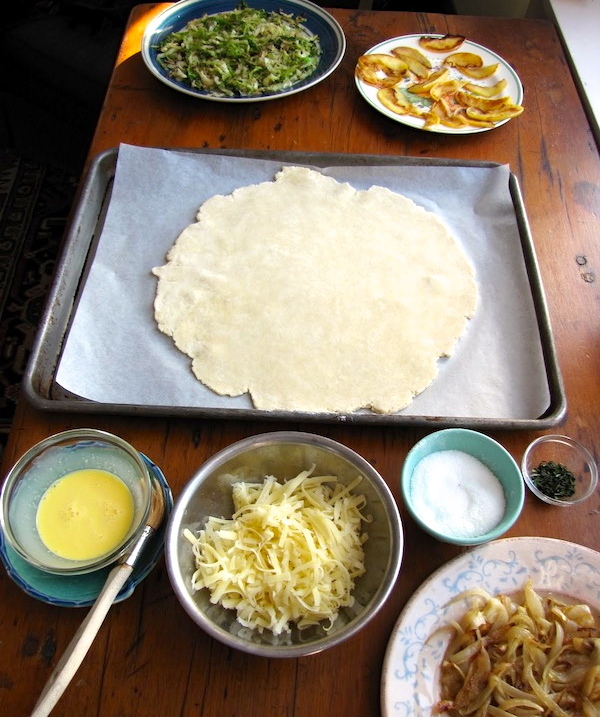 Transfer the dough to a parchment- lined heavy duty baking sheet. Make an egg wash by combining an egg yolk and heavy cream. 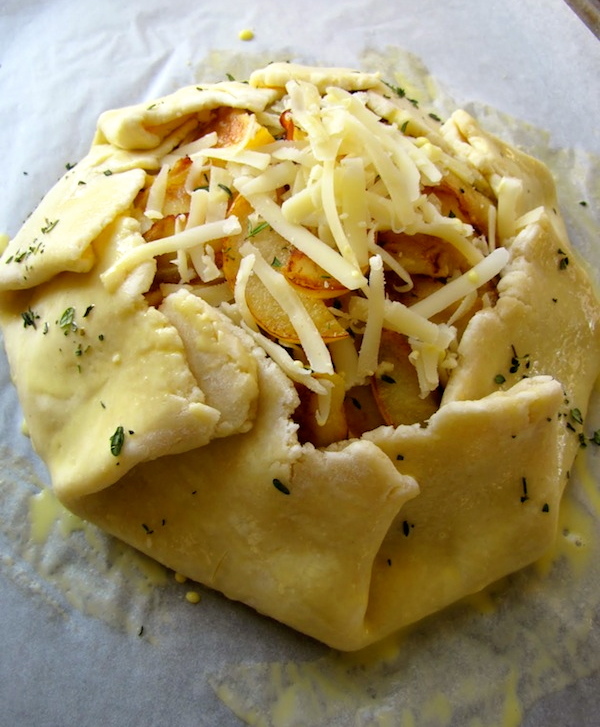 Arrange your first ingredient (usually cheese; in this case gruyere) in the center of the dough, leaving a 2-inch border all the way around. (Note, I could have done a much better job on this one–looks like 2 inches on one side and 4 on another! Maybe it was the camera angle.) Top with your next layer (in this case, sautéed cabbage). 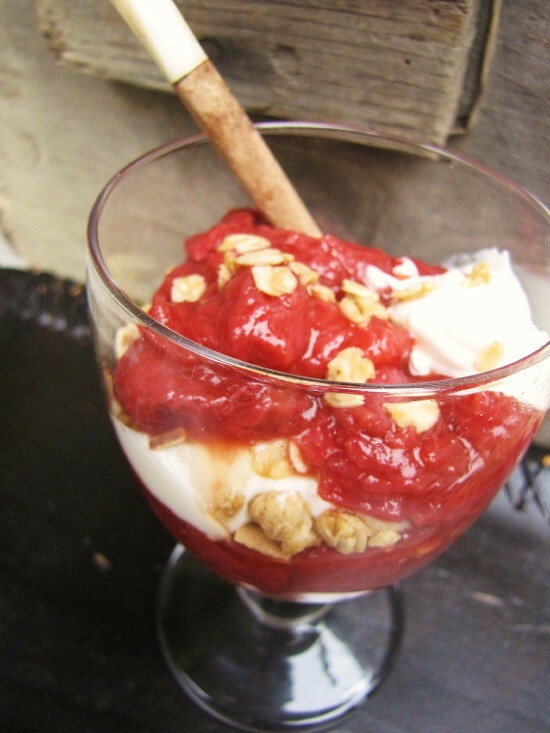 Continue layering your filling ingredients until you are done. 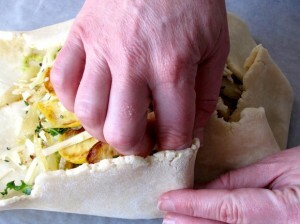 However you are most comfortable, pleat the edges of the dough up and over the filling. I find one pleat about every three inches works well. Continue pleating until the tart is contained. If cracks develop, don’t worry—you can pinch the dough together to seal it. Brush the edges of the tart (and underneath the pleated folds) with egg wash. Sprinkle with herbs, a little cheese, or a bit of coarse salt. Bake until golden all over (see top photos) and brown and crisp on the bottom (check with a spatula). Depending on the size of the tart, this usually takes about 40 to 45 minutes at 400 degrees. Let cool for several minutes and cut into serving pieces. Salad or soup optional! Easy, make-ahead, absolutely delicious. I swear, you no longer have to be afraid of pastry dough—of making it, rolling it out, shaping it—any of that. Yes, you’ll need a food processor (my favorite tool for making pizza dough, too), but oh, will you be happy with this ultra-buttery flaky crust. Makes enough dough for two 8- to 9-inch Rustic Tarts. 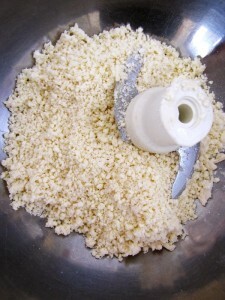 In the bowl of a food processor, combine the flour and salt. Pulse briefly to combine. Add the cubes of butter. Pulse quickly about 20 times, or until the butter particles are quite small (like tiny pebbles). With the motor running, add the ice water in a steady stream. (This will take about 10 seconds). Stop the motor. Then pulse quickly six or eight times—just until the mixture begins to come off the sides of the bowl and clump together. The mixture will still be somewhat loose and crumbly—that’s okay. You will bring the dough together in the next step. Alternatively, you can freeze the dough for up to a month. Defrost it in the fridge overnight before using. *NOTE: Depending on how long your dough disk has been refrigerated, it will most likely be between 50 and 42 degrees when you take it out. Anything in this range is rock hard. You’re looking for the dough to warm up to about 60 degrees. Don’t worry, you don’t have to take its temperature—it will be ready when it is still slightly cool but somewhat pliable. Again, depending on the temperature the dough was chilled to, and the temperature of your kitchen, this will take anywhere from 40 to 60 minutes—leaving 45 or so minutes is a good bet, but also don’t worry if you get behind. There is a decent window of time, and on all but the hottest of days (or kitchens), it can usually sit for up to 30 minutes more before it gets too warm. 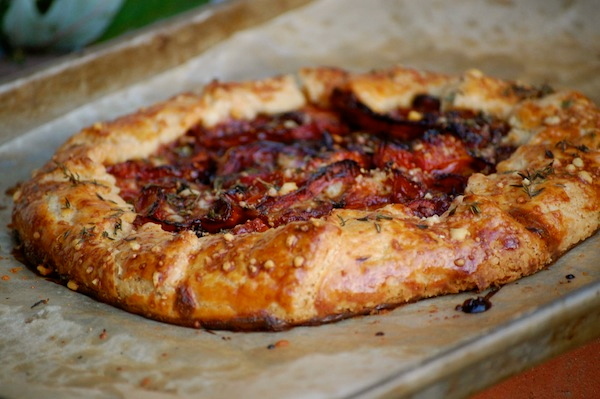 This week I am posting a primer on how to make one of my very favorite things in the whole world–a savory rustic tart (aka crostata or galette). Be sure to check out that post–not only for tips and photos on making the dough and assembling the tarts–but also for the easy food-processor dough recipe, too. 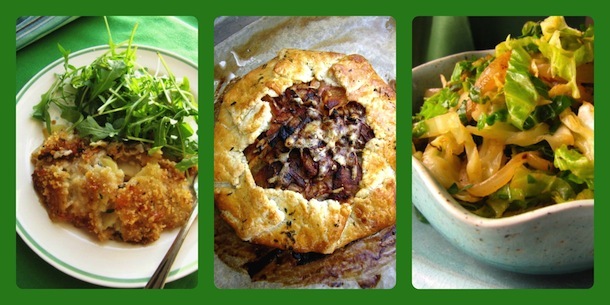 Then come back over here for a complete recipe for filling and assembling the cabbage, apple and onion tart (recipe follows). 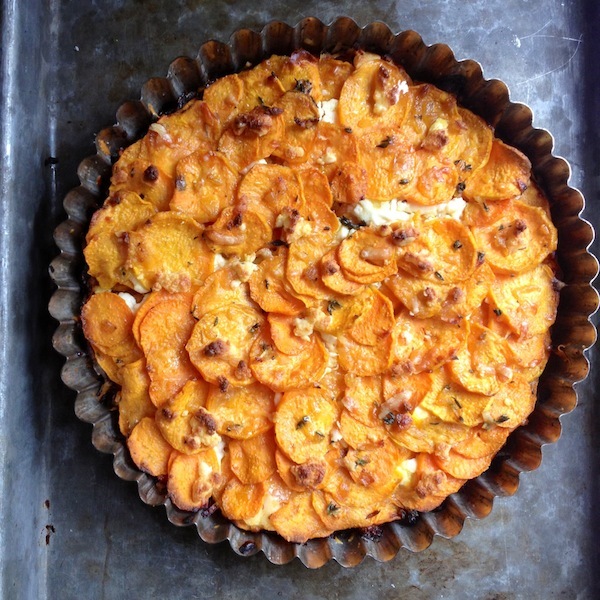 If you’ve got a copy of my cookbook The Fresh & Green Table, you can also use the guidelines over on that post to help you make either the Roasted Ratatouille Tart with Goat Cheese & Mint; the Seven-Treasure Roasted Winter Veggie Tart; or the Roasted Butternut Squash, Cranberry, Shallot & Pecan Tart. 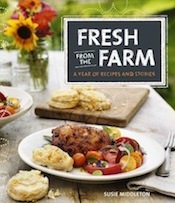 There’s also a Rustic Roasted Tomato Tart recipe (my favorite yet) in my new book, Fresh from the Farm: A Year of Recipes and Stories. I hope you’ll try one of these fun-to-make free-form tarts. 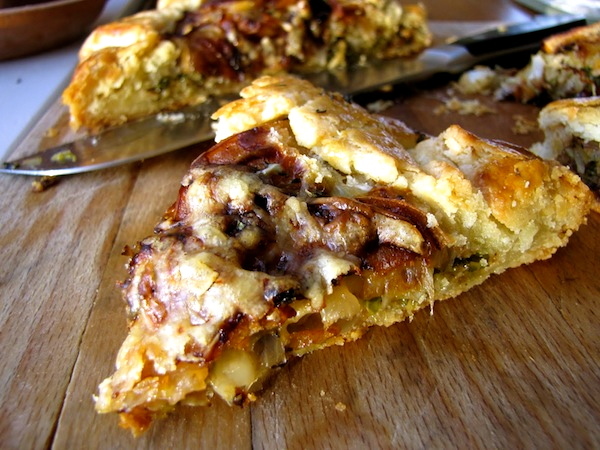 The crust is flaky, buttery, and delicious, and the savory fillings are the perfect counterpart. 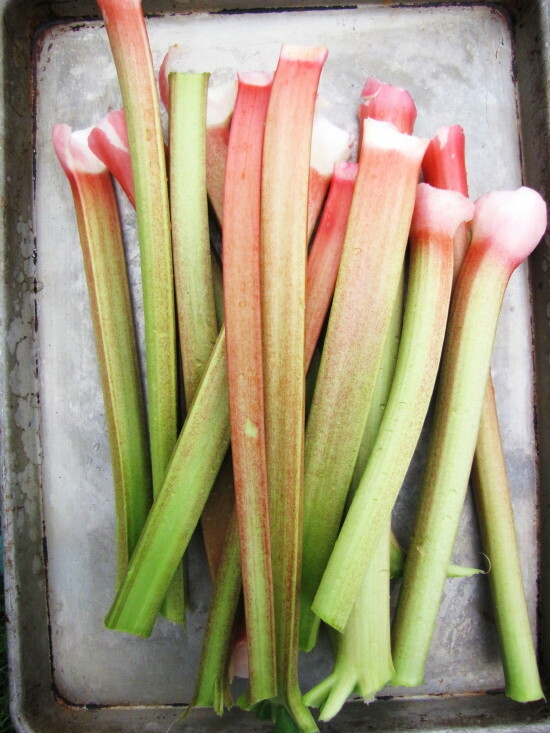 Serve a slice with a salad or a bowl of soup–or have a piece for breakfast! When I was developing my rustic tart recipes for The Fresh & Green Table, the filling for this tart was the surprise favorite with friends I never thought would be cabbage-eaters. 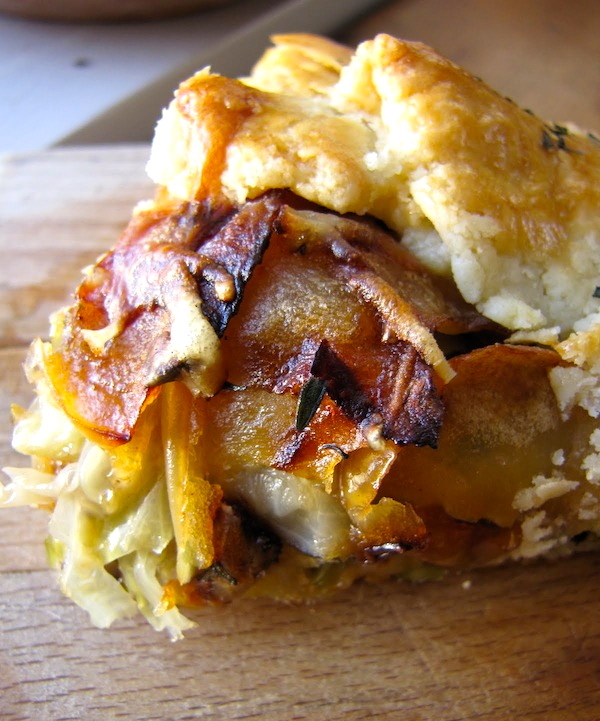 So I highly recommend this as a great way to introduce people to the ethereal (and traditionally Alsatian) combination of sautéed cabbage and onions, nutty gruyere cheese, sweet-tart sautéed apples, perky fresh thyme, and buttery, flaky crust. I also recommend closely following my sautéing directions for the filling—especially the cabbage. You’ll be cooking it in a relatively dry pan over relatively high heat, so that it will quickly brown (almost toast) rather than steam. 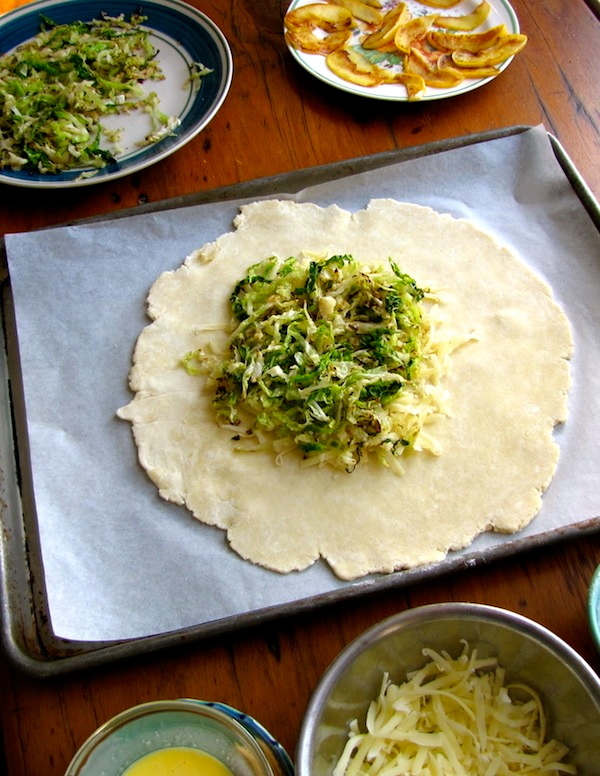 This is the secret to bringing out the wonderfully complex nutty flavor in cabbage. 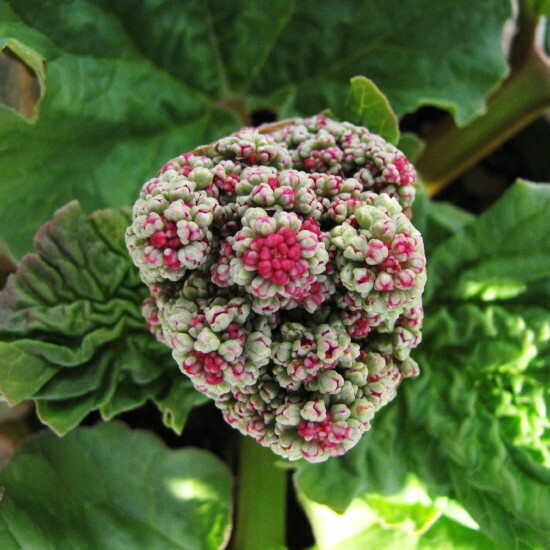 Be sure to use the beautiful crinkly-leaved variety of cabbage known as Savoy for this. 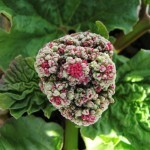 (You’ll find it in the grocery right next to green cabbage; it’s round, too, but with dark-green outer leaves.) The filling components cool quickly, so you can make them in about the time you’ll need to let your dough warm up after taking it out of the fridge. Preheat the oven to 400 degrees F. Set an oven rack in the center of the oven. 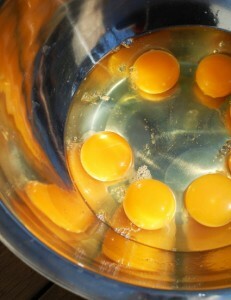 Whisk together the egg yolk and heavy cream in a small bowl, cover with plastic, and set aside. In a heavy 10-inch nonstick skillet, heat 1 Tbsp. of the olive oil and 1 Tbs. of the butter over medium-low heat. Add the onion and a pinch of salt, cover, and cook, stirring occasionally, until the onion is limp and translucent, 5 minutes. Uncover, turn the heat to medium, and cook, stirring occasionally, until the onions are golden brown, about another 6 to 8 minutes. Transfer the onions to a plate to cool. Add 1/2 Tbsp. butter to the pan, turn the heat to medium high, and add the cabbage and another big pinch of salt. Cook, tossing with tongs occasionally (only once or twice at first; let the cabbage have contact with the pan), until the cabbage is limp and nicely browned in spots all over (the thinnest pieces will be all brown but the green color will still be bright in the bigger pieces), about 5 minutes. Transfer the cabbage to a plate to cool. Take the pan off the heat, and let it cool for a minute or two before returning to the heat. 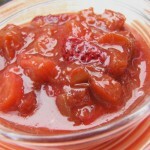 Reduce the heat to medium and add the remaining 1/2 Tbsp. butter. When the butter has melted, add the apple slices, season them with a pinch of salt, and spread them out in one layer (tongs help here). 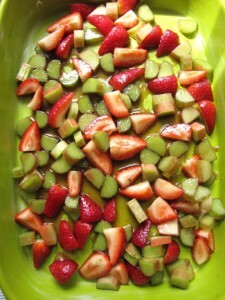 Let them cook undisturbed until very lightly brown on the bottom side, about 2 minutes. Flip and cook until the other side is very lightly browned, another 2 minutes. Transfer the apples to a plate to cool. Line a large heavy-duty rimmed sheet pan with a piece of parchment paper and position it next to a large cutting board or other surface you will use to roll out the dough. 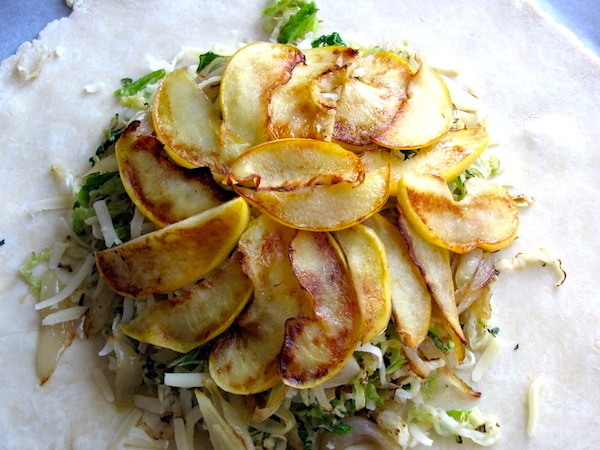 Arrange the cabbage, onions, apples, thyme and Gruyère around your work area. Sprinkle your work surface lightly with flour and spread it around with your hand. Put the disk of dough in front of you and lightly tap it with the rolling pin to start softening and spreading it. Then gently roll it out, lifting and giving the disk a quarter-turn after each roll, until you have a roughly 12-inch circle. 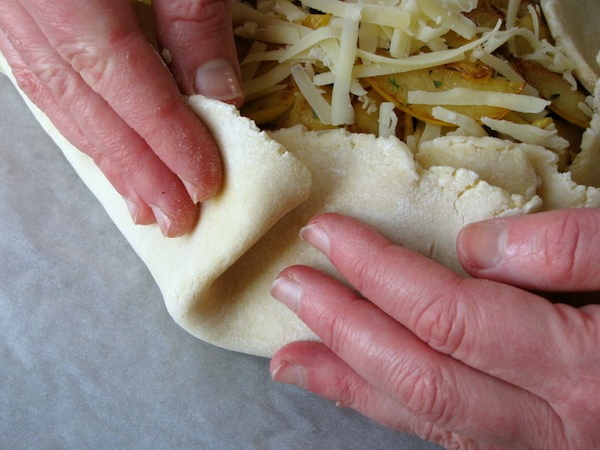 Try not to roll your pin over the edges of the dough, as that will tend to make the edges thinner than the center. (If your edges get very ragged or torn, it’s okay to patch them back together or trim them a bit.) If at any time the dough feels like it is sticking, lift it up and toss a bit of flour underneath it and/or over it. Transfer the dough to the baking sheet by rolling it up or draping it over your rolling pin and unrolling or undraping it on the baking sheet. 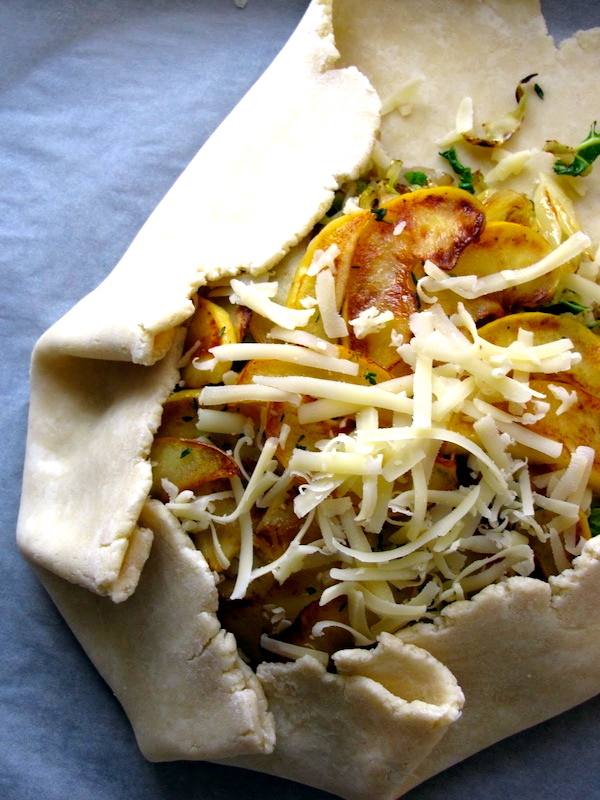 Sprinkle a quarter of the Gruyère over the dough, leaving a two-inch border around the edge. Arrange half of the cabbage over the Gruyère. Arrange half of the onions over the cabbage. Sprinkle them with a little bit of fresh thyme, and top with another quarter of the Gruyère. Repeat with the remaining cabbage and onions, and sprinkle again with a little thyme and another quarter of the Gruyère. Arrange the apples, very slightly overlapping, in the center of the tart (they will not cover all the filling). Sprinkle with a tiny bit of thyme and the remaining Gruyère. 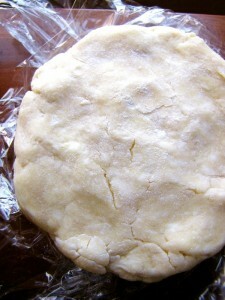 Pleat and fold the edges of the dough up and over the outer edge of the filling all the way around the tart. (You will be folding in that 2-inch border.) You don’t have to go crazy making a lot of pleats—folding a piece of dough in about every 2 to 3 inches around the tart will get you the results you want (you’ll have about 8 or 9 folds). Brush the edges of the dough with some of the egg wash (you won’t use it all), and sprinkle the edges of the tart with any remaining thyme. Bake until nicely golden all over and crisp and brown on the bottom (check with spatula), about 38 to 40 minutes. 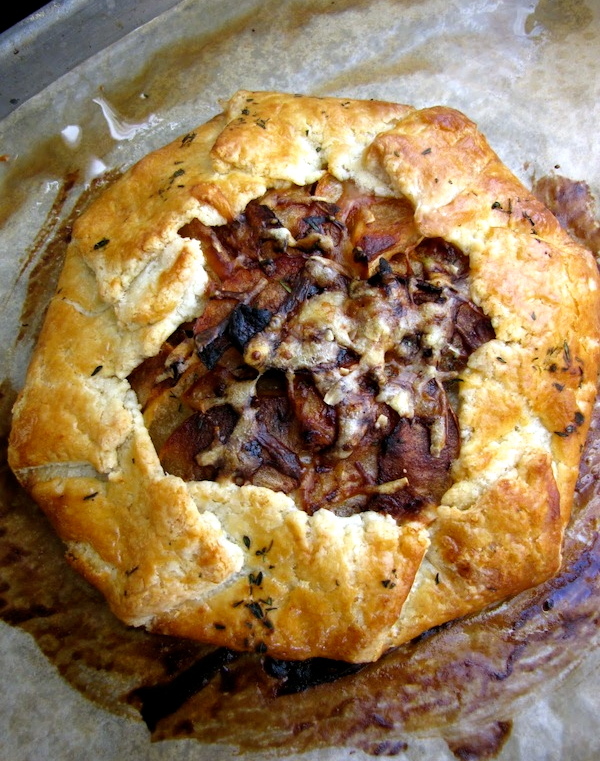 Let cool for a few minutes and use the parchment paper to slide the tart on to a cutting board. 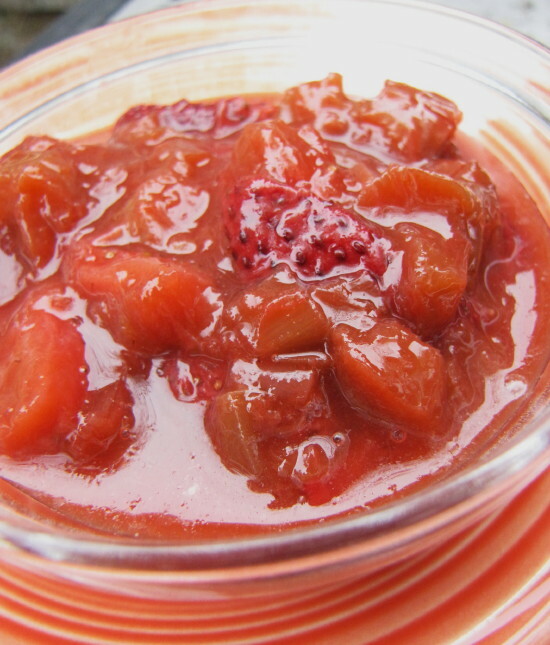 Cool for another 5 to 10 minutes before slicing and serving. Every year around Easter time (and believe it or not, this is sixburnersue.com’s third Easter), I start writing something about asparagus, even though we’re still weeks away from harvesting any local asparagus. I’ve always reassured myself that at least the vegetable is now in season in California; and after all, that’s where most of the country’s asparagus comes from—during the proper asparagus season. (Or at least it used to.) I’ve always found it ridiculous to buy asparagus out of season from South America (so I simply don’t eat asparagus in winter), but now I find it even more ridiculous that most of the asparagus in stores right now is coming from Mexico, which has underpriced California growers by so much that even California grocery stores sell Mexican asparagus. Okay, so despite my rant (sorry about that), I still wanted to give you a tasty asparagus recipe for Easter, so I went to the store and bought asparagus to cook with this morning—and I tried not to look at the label of origin. I’m comforting myself with the delicious bread pudding that just came out of the oven, and I am also using the excuse that this dish is really all about the eggs. I know, I know—I have a thing about farm-fresh eggs, too, with their rich marigold yolks and bouncy whites. But here’s the thing—it may be impossible to get local or even U.S. asparagus this Easter, but you’ve got more and more choice in eggs at the grocery store now. Look for the USDA Organic label (even Costco has Organic eggs! 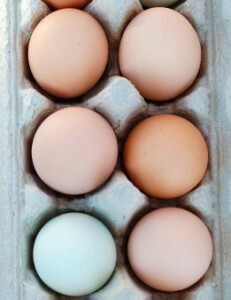 ), the Certified Humane label, or eggs that say “pastured.” Pastured eggs come from hens that truly do range over grass. (Unfortunately, the term “free-range” can be applied to hens that simply have a bit more room to stretch than the typical factory egg-layer which has 1 square foot of space allotted to her. 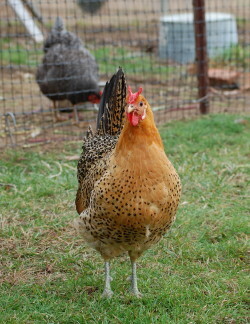 Some free-range eggs truly do come from “free-range” hens, but the term is a loose one.) And then there’s always the “grow-your-own” option! Backyard chicken keeping is one of the biggest trends going, so why not join in?! But if you’re planning to get baby chicks for Easter (our 50 babies arrive April 25), you will have to wait five or six months before they lay eggs. In the mean time, enjoy this eggy treat with friends and family this Easter morning and keep the spirit of new beginnings in your heart. Preheat the oven to 375 degrees F. Rub a 9×13-inch (3-quart) baking dish all over with a little butter. In a large heavy nonstick skillet, cook the bacon over medium-low heat until crisp and browned, about 10 to 14 minutes. Transfer the bacon to a paper-towel lined plate and break up into smaller pieces when cool. Pour off half the bacon fat from the skillet and add 1 tablespoon butter and the leeks. Season the leeks with a pinch of salt, cover, and cook, stirring, until softened and beginning to brown, about 6 to 8 minutes. Remove the pan from heat and let the leeks cool. In a medium nonstick skillet, heat the olive oil and the remaining half-tablespoon of butter over medium-high heat. When the butter has melted, add the asparagus and ¼ teaspoon kosher salt. Cook, stirring, until the asparagus is crisp-tender (it will still be somewhat green), about 3 to 4 minutes. Transfer the asparagus to a plate. In a large mixing bowl, combine the eggs, the milk, the cream, the chives, the thyme, the nutmeg, a couple dashes of Worcestershire sauce, and 1 tsp. salt. Whisk well to combine. Arrange half of the croissant pieces over the bottom of the baking dish. 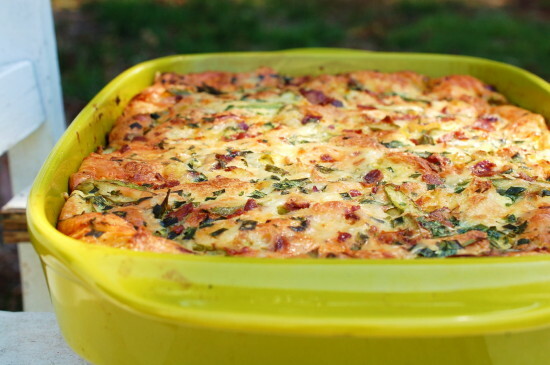 Sprinkle half of the asparagus, half of the leeks, half of the Gruyere, and half of the bacon over the bread. Repeat with the remaining bread, veggies, cheese, and bacon. Pour the egg mixture evenly over all. (Start at one end and pour slowly back and forth). Using your hands, gently press down on the bread and veggies to force the custard to evenly surround everything. Let sit for 20 minutes. Bake until the bread pudding has risen and is set and dry in the middle (it will be golden all over), about 40 to 44 minutes. Two fields over and across Scotchman’s Lane lies the house of our friend Katherine Long. Less than a half-mile as the hawk flies. (And fly it does. More on that in a minute.) 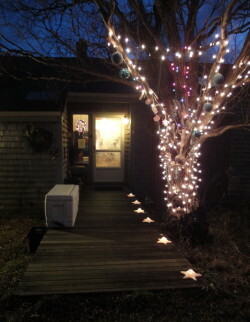 We trekked over to her Mermaid-and-Starfish-festooned place on Sunday for her famous Solstice potluck. Actually, we drove, though we would’ve walked if the snow really had turned from flurries to blurries like it did two years ago on the day of her party. The spread at Katherine’s was seductive. She’d made her real Texas chili, which is smoky and spicy with lots of ancho chiles. (She grew up in Hill Country.) My favorite. 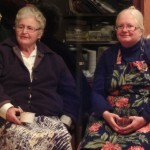 Friends helped her make dozens and dozens of deviled eggs (Katherine has sixty laying hens), and from there the list went on and on—ham, roast turkey, coq au vin, whole poached salmon, wild-rice and cranberry salad, quiche, carrot soup, house-made cheese (another of Katherine’s talents), sweets of every imaginable form, many from her good friend Rosemary Jackson. Roy and I went back for seconds…and thirds. The amazing thing is that Katherine keeps her party going from noon to 9 pm, and she invites anyone in West Tisbury who wants to come! 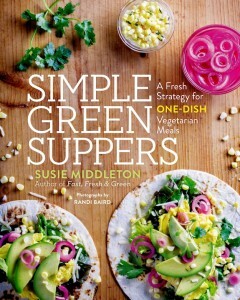 I am so impressed and also inspired to do a summer potluck myself next year. Tuesday afternoon I was just about to head out the door to retrieve a cutting board from Katherine’s when a Facebook post from her caught my eye. 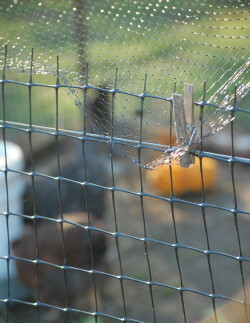 It was a photo (top of blog) of a young Red-tail hawk, in her yard, with its talons around a hen. 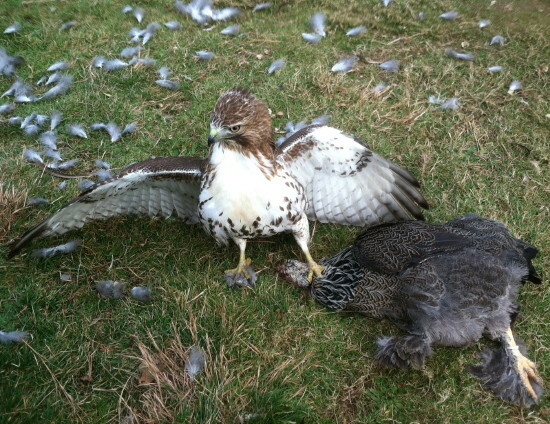 The hawk had mauled the hen but wouldn’t let go. Katherine poured a bucket of water over the hawk and still it didn’t budge. I believe that Katherine had to wave a plastic chair at the bird before it finally flew away. But in the process she managed to get a very up-close-and-personal photo. This arresting image stopped me cold because I was still enjoying the warm afterglow of her party—looking at all the photos of friends on Facebook and even enjoying some of the leftovers at home. It reminded me that while we humans gather together snugly inside our warm houses and begin to hibernate (with full larders at our disposal), the birds and the rest of the critters outside are still desperately focused on finding food and preparing for the winter. The birds in particular seem very antsy, and every time I’ve gone outside this week I’ve gotten a birdy-y surprise. 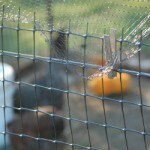 Yesterday I caught Farmer playing with something feathery in the yard. He was just kind of tossing it around—not biting it—and it turned out to be a mostly intact dead robin. Probably it had come to feed at the new feeder Roy just hung (the cardinals are loving it) and had accidentally banged into something. (Farmer also brought me a dead mouse this week—unfortunately this one was partially decomposed and full of maggots. Luckily I had my gardening gloves on when I reached in to his mouth to retrieve it. Yuck.) This morning our neighborhood flock of wild turkeys (5 adults and 2 juveniles) was hanging around our driveway, not 10 feet from my kitchen window, drinking water out of the puddles. I went out and shooed them away but they chose to trundle through the newly planted blueberry bushes on their way back down to the fence line. Harumph. The other day I caught one standing on top of the chicken coop. And then, around noontime today, just as Roy was pulling down the driveway, the hawk arrived. Maybe he (or she) flew over from Katherine’s place or maybe this was a different hawk, but more than likely they’re at least related, as we know there is a pair of adult hawks at nearby Whiting Farm that mate every year and hatch young trouble-makers. Of course, you’re not allowed to shoot a hawk (not that either of us was considering it or would really want to); you just have to be clever about scaring them off. Hence Katherine’s bucket of water. And Roy’s projectiles. He began tossing various objects at our visitor (right), who had alighted on a tree branch right above the chicken coop. 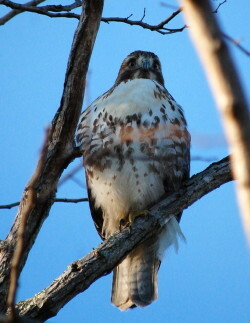 The hawk didn’t even flinch at the first few missives, but finally took off—for a taller, but still nearby tree branch. Then Roy and I cornered Perky. You see, Perky has been free-ranging this week while all the other hens stay in their protected yard, which is adjacent to their coop and covered with bird netting. Perky has been such a bad girl that we actually considered sacrificing her, but when faced with the imminent reality of that today, we quickly scooped her up and put her back in the pen…where, unfortunately, she will do what she does every day—peck at least one of the eggs that the other hens have laid. There’s even strange bird activity inside the house: This week our love bird, Ellie, laid two eggs. We’ve had her for two years and she’s never laid an egg. They look awfully big (bigger than a marble) for such a tiny bird, but she is very pleased with herself and sits haphazardly over the eggs all day long, puffing her lollipop-green feathers out proudly. Thankfully these eggs aren’t fertilized, so we won’t have any baby lovebirds. Whew. I admit, I still have a curious and not entirely loving attitude towards the birds of the world. I keep writing about them, because I am surrounded by them, and I know there is some meaning in this. 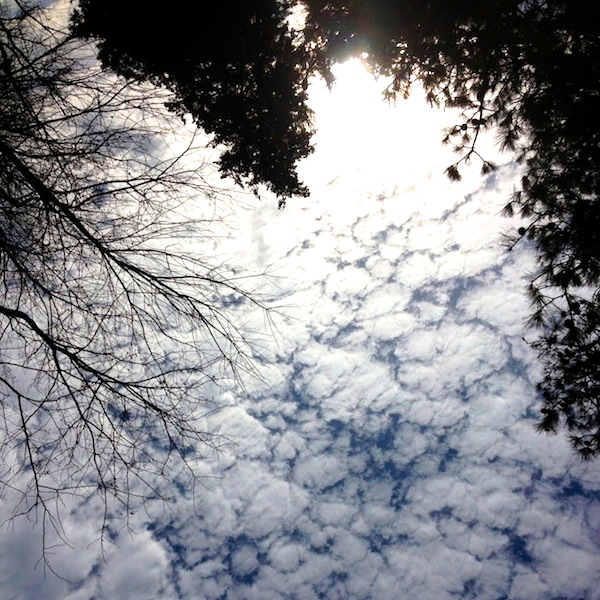 (I will probably freak out when a dove flies by some day carrying an olive branch—miracle believer that I am.) Roy loves birds and our dear friend Joannie loves them. 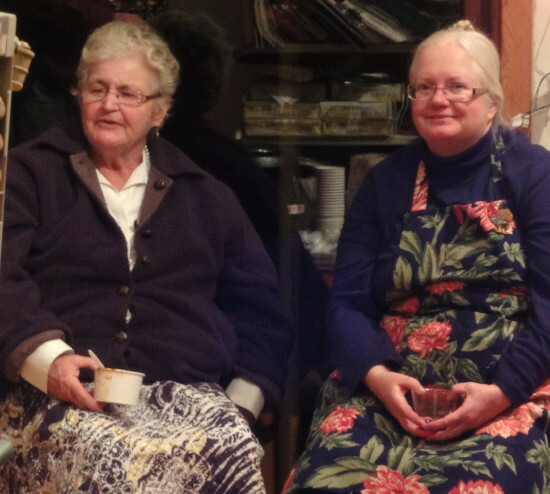 (In the photo below, that’s Joannie on the left and Katherine on the right at the Solstice party.) In fact Joannie feeds the pair of swans down at the Mill Pond twice a day. So yesterday I was baking the last of some Christmas cookies and made Joannie a special batch. Libby and I had discovered a tiny swan cookie cutter in our collection a few weeks ago, which immediately made us think of Joannie. So I’m giving Joannie the cookies and the cookie cutter for Christmas. 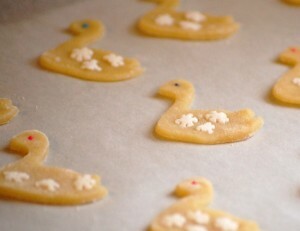 And for right now, I think my favorite kind of bird may be the edible kind—preferably with sugary sprinkles! P. S. Thanks to Katherine for furnishing me with the photos at top and bottom.